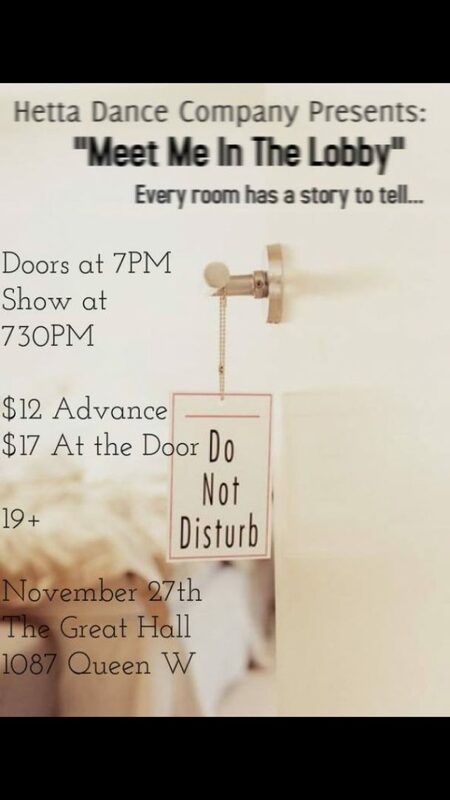 Our very own Lena Wiklund is presenting the dance production “Meet Me in the Lobby” on Thursday, November 27, 2014! In anticipation of the show, we are giving away four free tickets to the first four people who show up to Joy of Dance Centre to inquire about the production. Participants must arrive in person to receive a ticket. Hetta Dance company is proud to present it’s second production “Meet Me in the Lobby”. Hetta Dance was created by Lena Wiklund in January 2014. Hetta aims to create contemporary dance shows with a story line making it accessible to dancers and non dancers alike. “Meet Me in the Lobby” is about people passing through a hotel room. Inspired by Lena’s travels and the interesting people she met along the way the show takes small clips of the lives that happen inside the hotel room. When: Thursday, November 27, 2014 at 7:30 p.m. Cost: $12 in advance or $17 at the door. Please contact hettadance@outlook.com or text 647-229-6045 for tickets or more information.